Losing weight, and keeping it off, can be a challenge. And while there are many online tools and resources to help, picking the right one out of hundreds of options can be bewildering. We’ve found three that will help get you where you want to be. One tracks calories and two create customized workout plans. With over 5,000,000 items in the food database, this calorie counter and diet app allows you to keep track of what you eat and drink. And with the exercise database, you can also easily find out and record how many calories you burn when you exercise. When you create a profile, enter your age, height, weight, gender, and normal daily activity level. These factors determine the calories needed to maintain your current weight. You’ll also be asked how much weight you want to lose per week. This number will determine your new daily calorie and nutrient needs. You can achieve your weight goal by eating the specified number of calories per day, with no additional exercise. If you do exercise, the daily calorie goal will increase (giving you permission to eat a little extra snack!). Ian Cardenas, personal trainer and owner of Northbayfit in Lake Leelanau, recommends MyFitnessPal. “Your nutrition is the most important part of your fitness goal,” Ian says. The app was designed by Chris Jordan, the director of exercise physiology at the Johnson & Johnson Human Performance Institute. There are 72 exercises and 22 additional workouts that can be modified to fit your current level of fitness. Start with the original 7 minute workout which includes exercises such as jumping jacks, wall sits, squats and high knees, along with others, then move on to more intense workouts like the 21 minute cardio blast. Answer a few basic questions such as your current level of fitness and motivation level, and the app will create a smart workout with a mix of exercises just for you. During a workout, watch the clock or the trainer video on the phone screen, or listen to music. The brief workouts can be done anywhere, anytime—all you need is a wall and a chair. 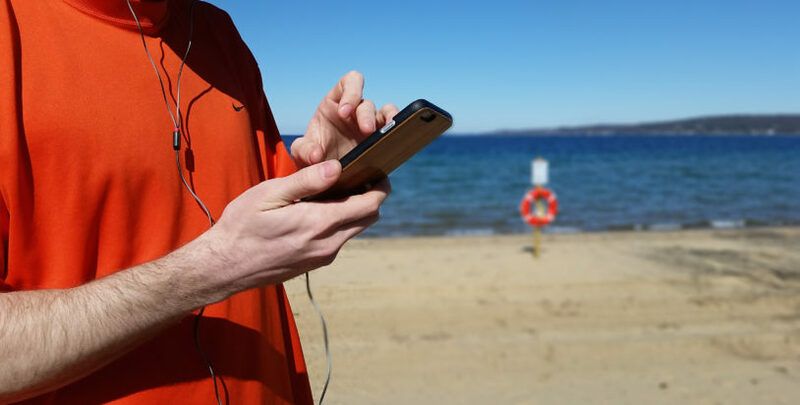 The app logs the workouts so you can track progress and share results with friends. C25K, or couch to 5K, is for beginner runners who want to complete their first 5K race. The 8-week program begins with walking and running, and soon you’ll be able to run the full distance. The plan includes three workouts a week, and each session is 30 to 40 minutes long, including 5 minutes to warm-up and 5 minutes to cool down. The audio coach tells you when to walk or run with instructions such as, “begin running for 1 minute. You are on run two of eight.” You can listen to your own music, and the app is compatible with MyFitnessPal, so you can track your calories burned at the end of each workout. Complete a 5K race, and move on to the 10K app!